Tonight I would like to share with you a card that I made last month. My crafty friends who know me know that I do so love my butterflies and my favourite colour is purple (any shade). This card I have managed to incorporate two of my favourite things. 1. 8 x 8 scalloped white card which I have matted and layered white floral paper distressed with PanPastels Violet, I then wrapped lilac satin ribbon around before matting onto the base of the card. 2. 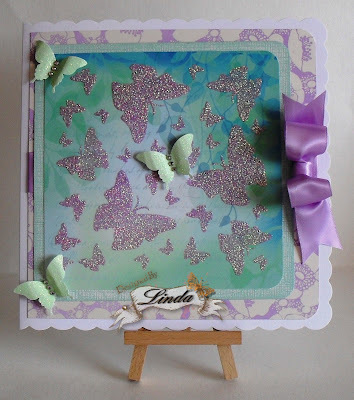 The patterned paper I stencilled the Butterflies using Sparkle Medium Soft Purple. Once dry I matted and layered onto green card. 3. I made a bow and punched out 3 green glittered butterflies and added gems to the centre of their bodies. Labels: Butterfly Flight Stencil, Imagination Crafts background papers, Sparkle Medium Soft Purple. Hi all, Jennifer here with another card. The weather in our neck of the woods is beautiful today. After a chilly start it has turned out warm and sunny. Today's card is one I made for Imagination Crafts for a QVC Show in January of this year. It is such an easy card to make and quite quick too and looks very effective. 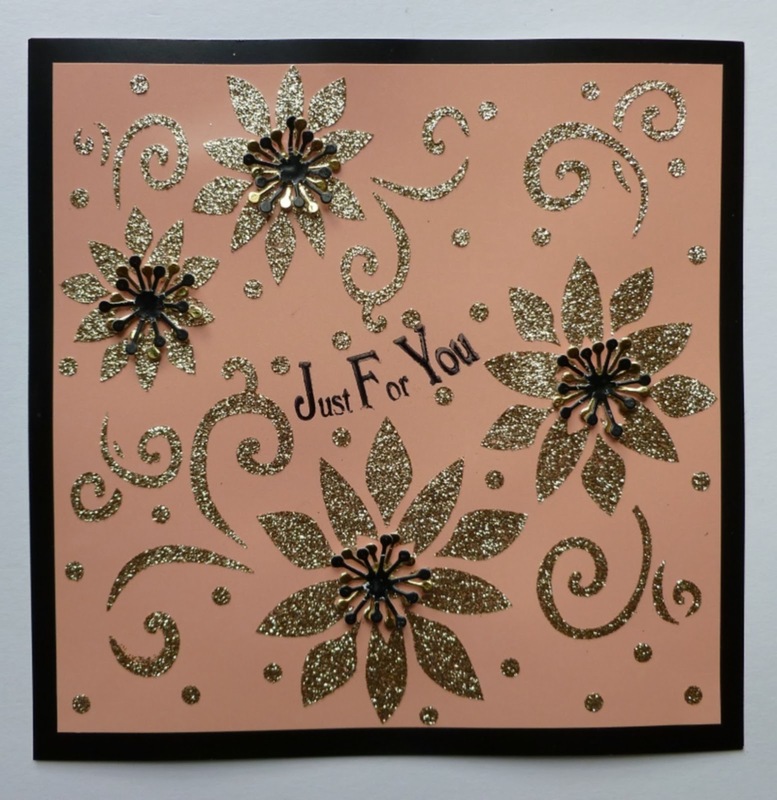 The three main items you need to make this card are The Fir Tree Stencil, Sparkle Mediums and the backing card. Well let's get started shall we? Base card is made from yellow card. Onto this I matted some dark green card, leaving a small border of yellow showing. 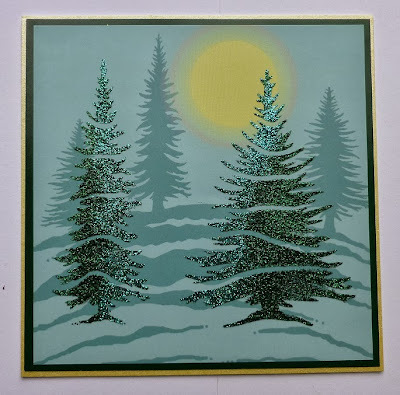 Take the fir trees background card and lay the stencil onto it and spread the sparkle medium over it using a spatula. When dry, trim around the edges of the background card so as to leave a small border of the green card showing when the background card is matted onto the green card. That is it finished folks, very quick and easy. If you have never used the sparkle medium before Sue has a how to use sparkle medium on the Imagination Craft's website. It really is easy to do, believe me lol! I am feeiing good and I hope you are too! A little bit of sunshine does us all good lol. Today's card I made in April this year for Sue and Harvey of Imagination Craft's. Make a base card from black shiny card. Take a piece of peach satin card, cut slightly smaller than the black card. Lay the Lily Flourish Stencil on top and spread the Sparkle Medium over it. Remove stencil and leave the image to dry. 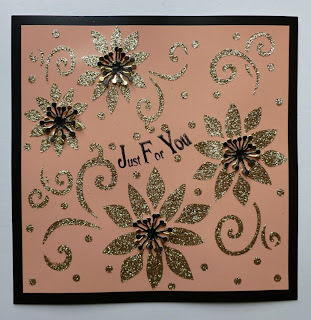 Stamp the sentiment 'Just for you' in the centre of the design using a black ink pad. I curved the stamp gently when I put it on my stamping block so the sentiment when stamped, was curved instead of just straight. Die cut four black and four gold stamen, using a die-cutting machine and glue them to the centre of each lily. Matt the peach card onto the black base card and then the card is finished. A very quick and easy card to make. Until the next time, happy crafting.